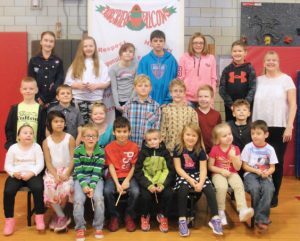 Several students at Fairgrieve Elementary were recently honored during the school’s Morning Express program because they worked hard at achieving a goal throughout the month of October. Fairgrieve Elementary students are happy to have been selected as “On a Roll” honorees for the month of October. Nominated by their classroom teacher, each recipient received “On a Roll” recognition and a “brag tag” from Principal Jean Sampsell to add to their collection. Their classmates, teachers and special guests also sent them congratulatory wishes and applauded their efforts. Honorees in row one, from left, are: Scarlet LaVere, Rose Douglas, James Bentley, Amador Gonzales-Ortiz, Raymond Hager, Harlow Hayward, Shelby Taylor and Andrew Chappell. In the second row, from left, are: Joe Foley, Hayden McCauliffe, Sophia Hudson, Trystin Shoults, Lloyd Pierce, Matthew Beebe and Noah Quesnell-Squairs. In back, from left, are: Valerie Nichols, Cayley Cunningham, Isabella Salotto, Eric McLoughlin, Angelina Ferro, Mikey Noel and Principal Sampsell. Absent are: Zoey Miner, Brooklyn Wright-Curcie and Emma Allen.